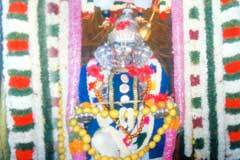 Celebrated Vaishnavite Acharya Nammalwar has praised the Lord in his Mangalasasanam hymn. 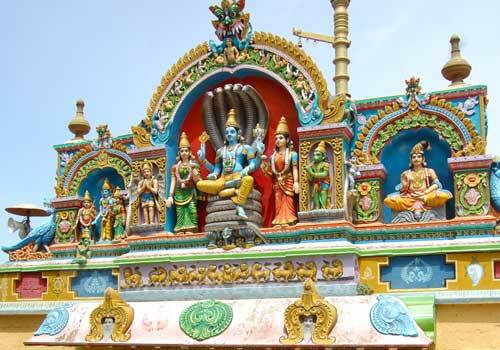 Adi Swati day when Lord took Saint Kulasekhara Azhwar to His Vaikuntam Abode in July-August, 10 day Chithirai festival in April-May, all Purattasi Saturdays in September-October, Avani Tiruvonam in August-September are the festivals of the temple. 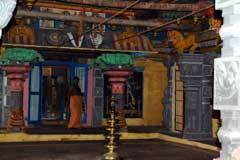 Oonjal Sevai is exclusively observed for the Perumal of this temple only in Kanyakumari district. Lord Tiruvazh Marban (Lord in whose chest Mother Mahalakshmi-Goddess of Wealth resides) graces devotees with His four hands, one assuring safety (Abhayahastha) and holding the conch and discus in other hands. 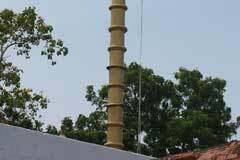 The 9 feet tall idol is made of a material called Kadu Sarkarai Yogam, a mixture of stone and lime and coated with a glue made with sugar and mustard. Hence, no abishek is performed to the presiding deity, only to the procession deity. The temple is open during normal hours as in all temples. 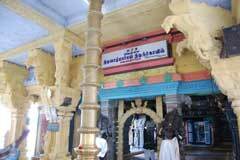 Sri Tiruvazh Marban Temple, Tirupatisaram, Nagarcoil. 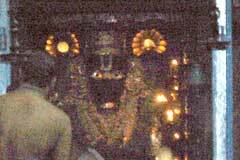 Devotees perform Tirumanjanam to Lord and Mother offering Vastras. 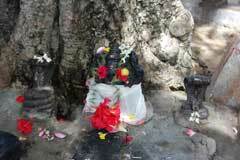 Mother Udayanangai delivered a male child on Visaka Star day in Vaikasi month (May-June) on a poornima-full moon day. They took the child as directed by Lord in a golden cradle to the tamarind tree in Azhwar Tirunagari. The child simply climbed on the tree with Gnana Mudra, meditated upon Lord Aadhi Natha to the chilling surprise of those gathered there. The child was in penance for 16 years. 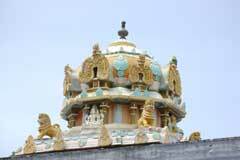 This is the sacred history of Tirupathisaram. 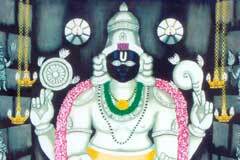 Miracle Based: Lord Tiruvazh Marban (Lord in whose chest Mother Mahalakshmi-Goddess of Wealth resides) graces devotees with His four hands, one assuring safety (Abhayahastha) and holding the conch and discus in other hands. The 9 feet tall idol is made of a material called Kadu Sarkarai Yogam, a mixture of stone and lime and coated with a glue made with sugar and mustard. Hence, no abishek is performed to the presiding deity, only to the procession deity. 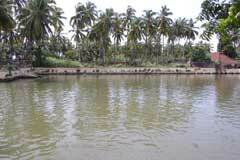 Thirupathicharam is 30 km from Nagarcoil. bus available from meenakshipuram bus stand.